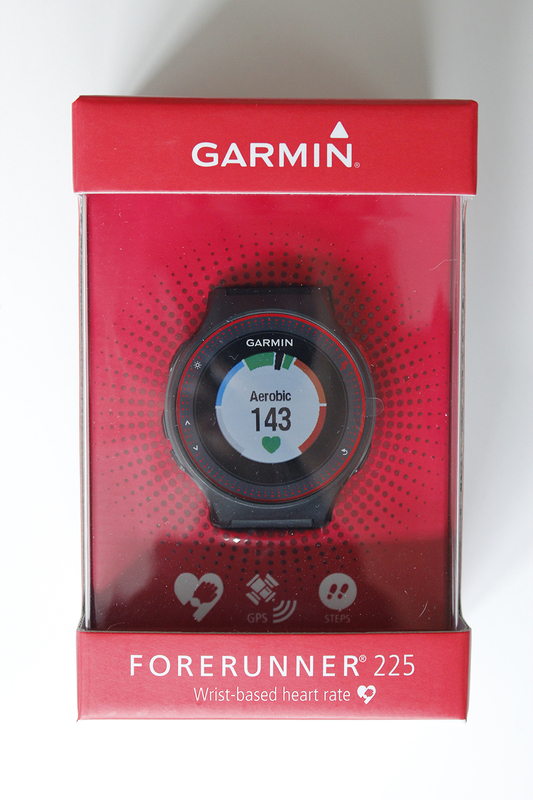 The Forerunner 225 comes with a built in, optical heart rate monitor and is the evolution or big brother of the Forerunner 220. 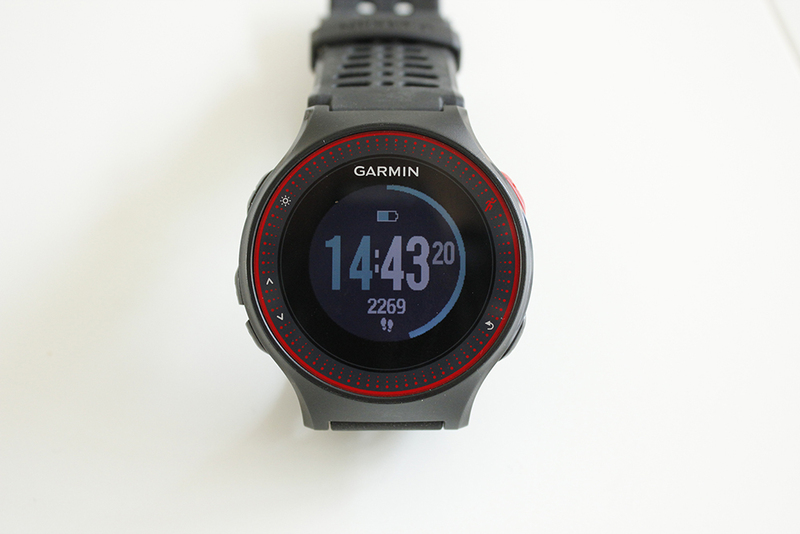 It’s purely a runner’s watch and Garmin has focussed on making the heart rate easy to see with the new HR gauge display option. The FR225 comes in a nice box with a charger and some instruction manuals. Actually in about 25 different languages, but that might just be the European package. Once unpacked you instantly notice the back, the integrated heart rate monitor looks pretty sweet. It’s a proven technology, licensed by Mio. But also not unimportant is the looks. It’s a bit bigger than the 220. Not in diameter, that’s exactly the same. But the build to the strap is a bit bigger and due to the HR-sensor the watch sits a bit higher. 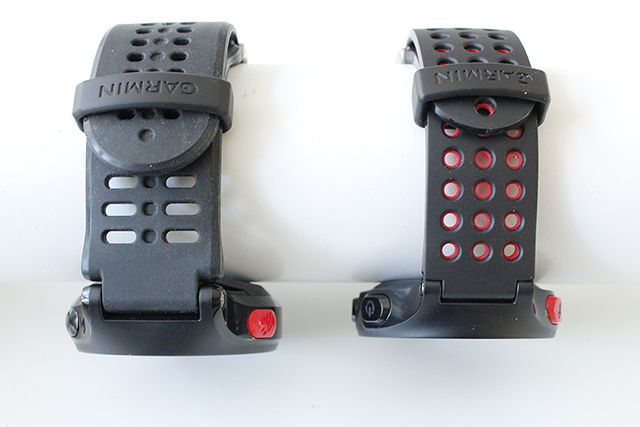 The FR225 with integrated HR monitor on the left and the Forerunner 220 on the right. On the display not nothing changed. 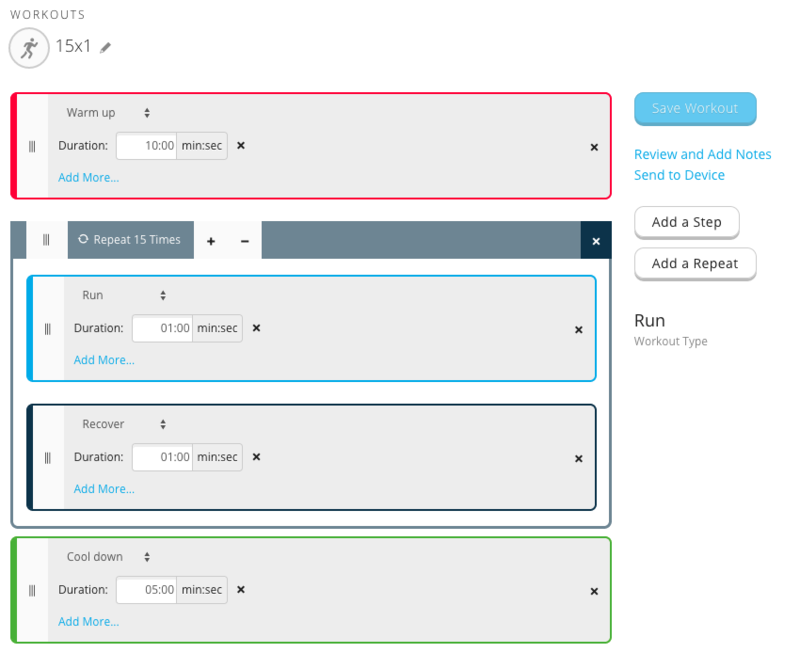 You can set up to three fields with the metrics you want on two displays. Using the up and down button you can scroll through them. I show this in the video below. 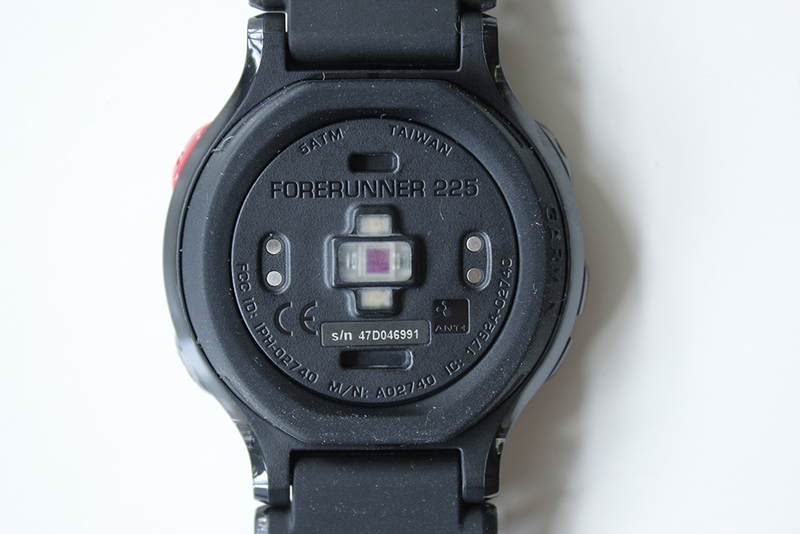 The Forerunner 225 is just like it’s brother, the Forerunner 220, a running watch. Light on the wrist and one setting: Run. What’s new is the HR Gauge. A feature I really like. This feature does not exist on the 220. You can disable it if you don’t like it, but the gauge tells you in a glance where you are. Using colors and the gauge itself. 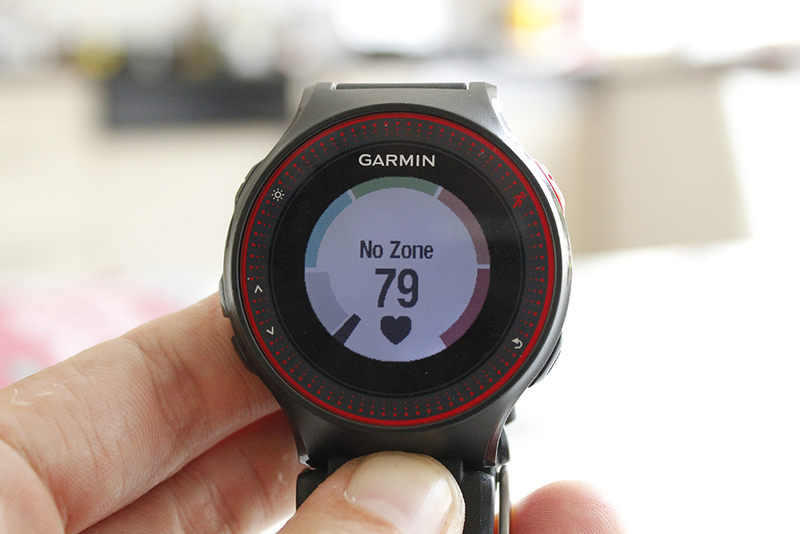 You can set the HR zones manually if you want too, either on the watch itself or on Garmin Connect. When on the move the gauge will move up. The zone name changes and the heart icon gets a color too. 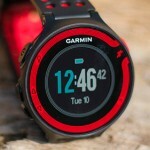 Using the built in accelerometer the watch will record your cadence too. If you’re new to running cadence I can strongly advice to read up on this, but recording it is a first step. It’s useful data. 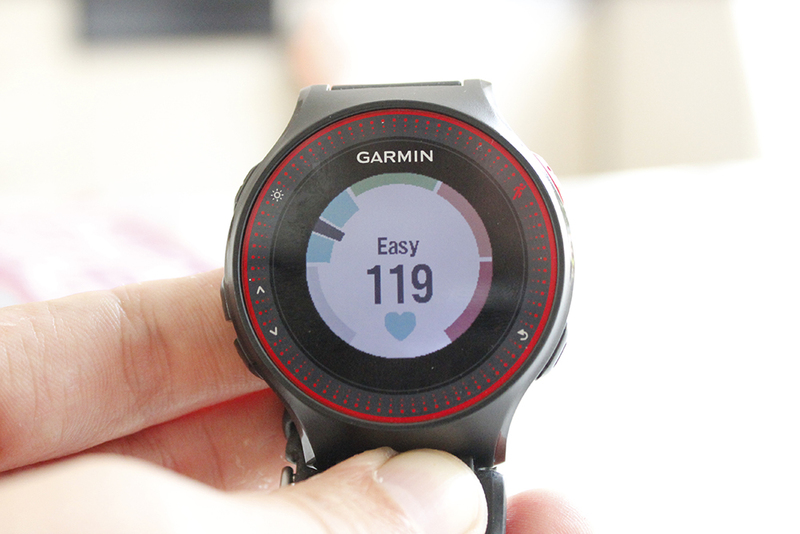 On the watch itself you can start simple intervals. Adding a warmup and a cool down to a little run/rest loop. But online you can create complex, long workouts. Or just grab a ready made training plan and start with that. The ready made training plans vary from a 5K goal to a full marathon, and on different levels too, from starter to experienced runner. To create your own workout, sign in online and from the fold out menu scroll all the way to the bottom to Workouts. You can set multiple repeating blocks with any block in there. A simple 15×1 run workout with warmup and cool down. And for each step you can set the duration: by time, distance, lap button press, calories or heart rate. But you can also set the desired boundaries: Speed, Pace, Cadence, or heart rate zone (or even a custom zone). Once saved & synced to your watch using either the charger cable or your phone you can start the workout and the watch will alert you to stick to the plan. 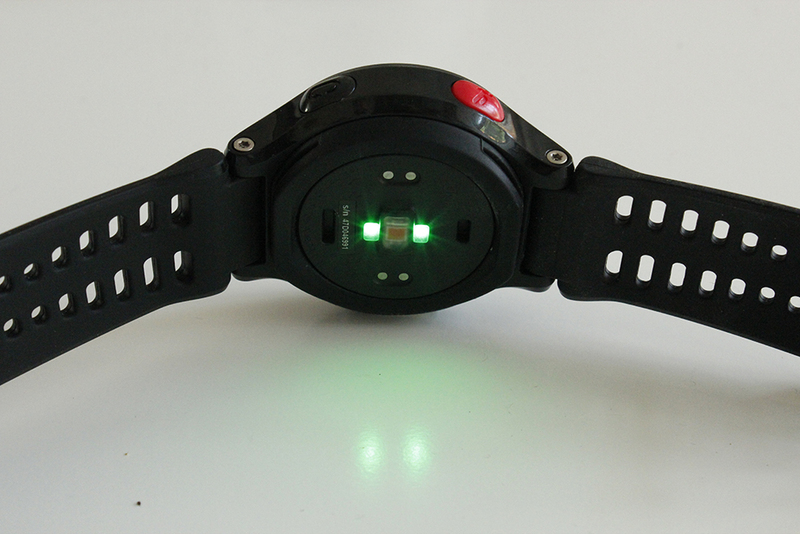 The built in, optical, heart rate monitor is the same Mio technology as you see in other devices. Mio is a well know player in this field and dominates the optical HR market. 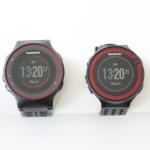 Garmin cleverly added a small rubber ring to the back of the watch. This prevents from light leaking under it, which compromises accurate reading. The rubber ring is easily removed and replaced. Also, because of the rubber ring the readings are more accurate when you don’t have the watch on tightly, moreover, you don’t have to put it on tightly, making it more comfortable to wear. 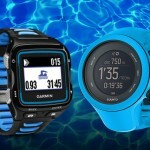 Garmin’s FR225 in red and Wahoo TICKR X in blue. As you can see it’s a bit off for the first 10 minutes or so, but I was playing around a bit with the buttons, then I hit some loose sand and had to focus on running and not the watch and my phone. Overall a really good result if you ignore the first bit. The watch wasn’t strapped on very tight either. Additionally you can pair with an external HR monitor if you want. For when you are on the bike and have the watch wrapped around your steer for example. However, the watch doesn’t support any other activities, so you’ll have to change that afterwards. 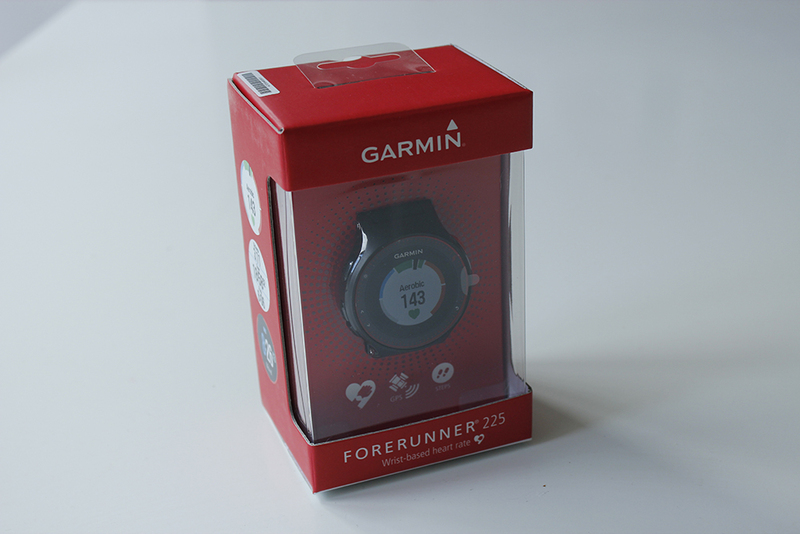 As the FR225 has a built in accelerometer it can track your cadence during your run, but it will also count your steps during the day. 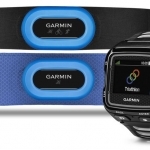 You can choose to set the desired goal or let Garmin decide it for you. You can also set alerts to tell you to move once you’ve been sedentary too long. When in lock mode, using the up and down buttons, you can switch through your data. Steps taken, distance walked, current heart rate. You can see in the the video below. The watch has built in bluetooth, but only uses this to pair with your phone (not for sensors!). Using the Garmin connect on your phone you can sync your sessions, activities and planning. And as almost normal by now, broadcast your session live via Garmin. This will drain your battery though, don’t expect to run a marathon with it. 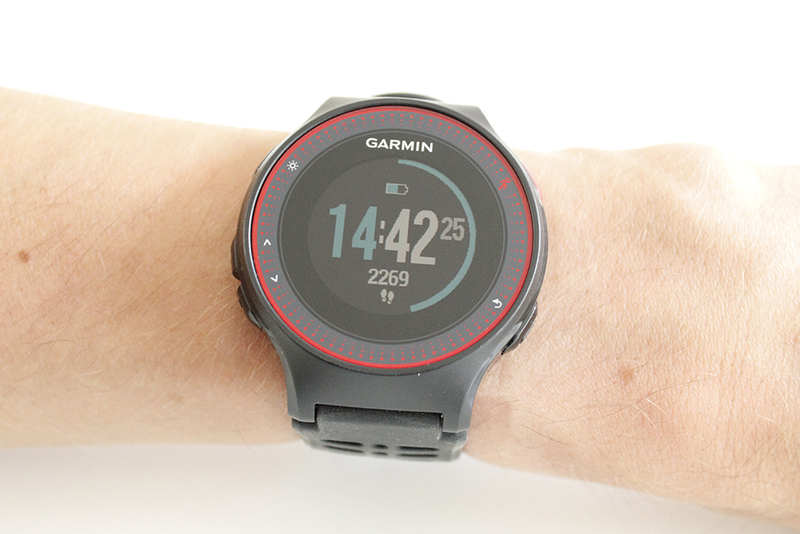 Overall the Garmin Forerunner 225 is an absolute brilliant watch. 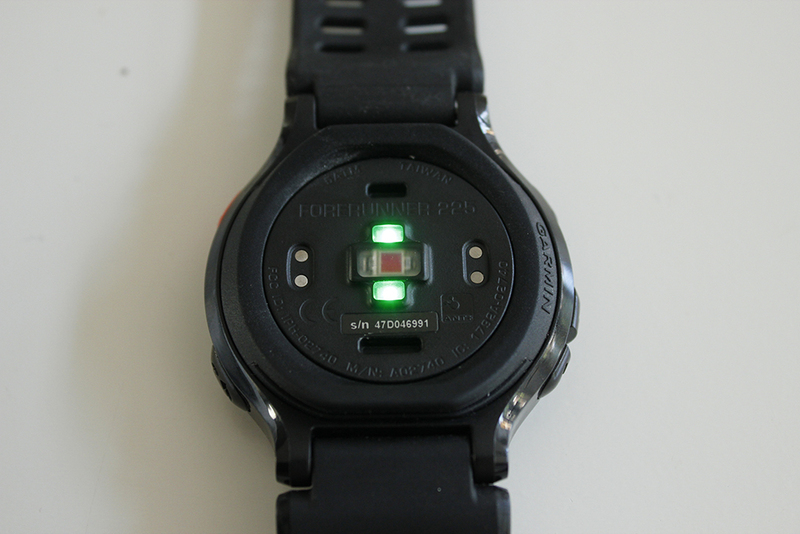 Light enough to forget you’re wearing it, in addition the rubber light protective strip makes the HR monitor work perfectly. 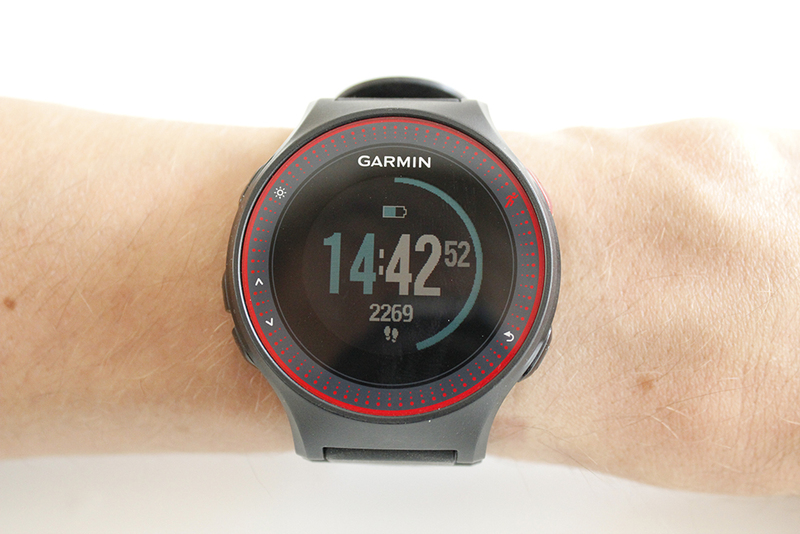 It’s an absolute great watch for any runner at any level. If you want to buy the watch, please use the link on the price, it’s the lowest price my system has found of a local supplier and I get a small fee for it. This allows me to maintain this site!